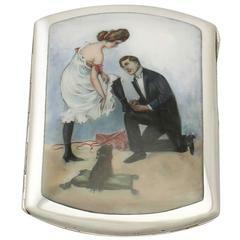 A fine vintage German silver and enamel card case; part of our boxes and cases collection. This fine German vintage card case has a rectangular book shaped form. The anterior surface of this vintage card case is embellished with a hand-painted panel depicting bi-color nicotinia flowers on a white guilloche enamel background. The posterior surface of the case is plain and unembellished. The hinged cover opens to reveal the original silk and leatherette wallet style interior. The hallmarks struck to the anterior surface of the reverse cover include: Silver quality/purity mark: 935 (935/1000) Additional mark: Made in Germany Dimensions: Height 10.5cm/4.2" Width 7.7cm/3.1" Depth of spine 1.5cm/0.6" Condition: This vintage silver card case is a very good gauge of silver, very good quality and in excellent condition. There are minor surface scratches to the surface of the case, in keeping with the age. The enamel is in perfect condition. The interior of the case shows some signs of wear, but can be considered to be in good condition. The hallmarks to the surface of the posterior cover are all very clear. Maker: Unmarked Date: circa 1940 Origin: Germany, Europe. Video: A video of this fine piece is available upon request. Reflections in photographs may detract from the true representation of this piece of vintage silverware. This vintage card case is very good quality and in excellent condition. There are minor surface scratches to the surface of the case, in keeping with the age. The enamel is in perfect condition. The hallmarks are all very clear. German ebonized wood violin case, circa 1880. Elegant shaped case with bentwood trim edging. The interior is lined with green wool felt.